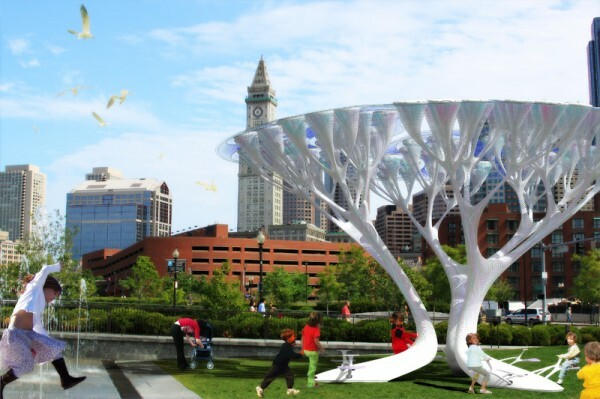 Boston’s TREEPODS INIATIVE proposes to embody, and artificially enhance, the most important biological characteristic of natural trees: the capacity to clean the air, taking the CO² and releasing O². 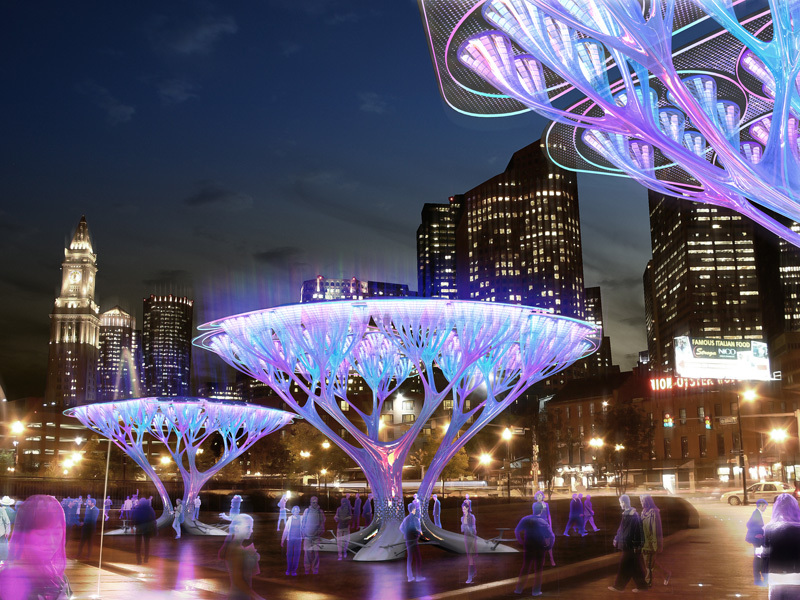 Boston’s TREEPODS INIATIVE is a sustainable project leaded by Influx_Studio and ShiftBoston. The aim ff this collaboration is to allow the achievement of Boston’s global goals in terms of carbon reduction programs in the short time, giving us enough time to make the change from the present fossil fuel economy into a new Zero carbon energy economy. 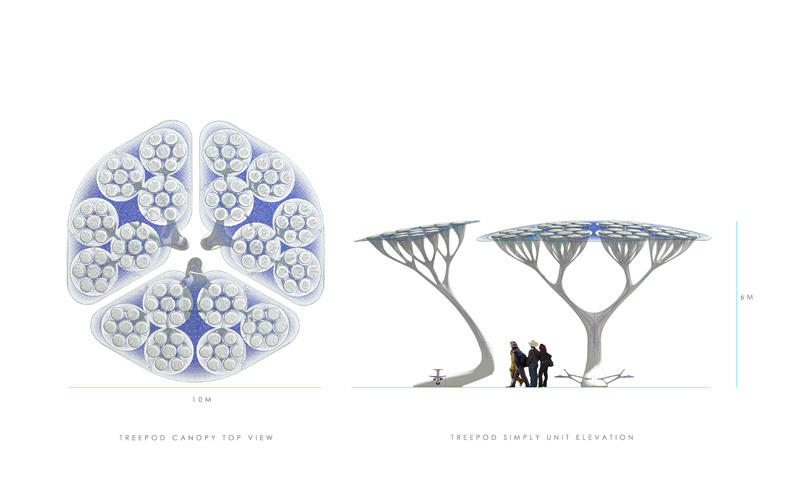 The proposal could be define as a CO2-scrubbing living machine. Treepods may well redesign in an urban radical new way our polluted urban environment, interacting with natural trees, and enhancing its carbon absorption capacity. In that way, those artificial trees don’t replace the natural ones, but they act like small urban “air cleaning infrastructures”. Advanced technologies are actually already developed that allow the capture of the atmospheric carbon dioxide from ambient air in an efficient, economic and sustainable way. 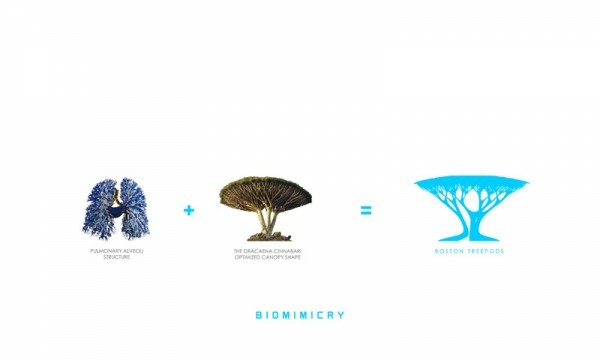 Developed by Dr Klaus Lackner, Director of the Lenfest Center for Sustainable Energy at Columbia University, this revolutionary process is based on the discovery of the ‘humidity swing,’ a technology that enables the energy-efficient capture of CO2 from air, allowing to close the carbon cycle and creating a valuable product for beneficial use. The aim of the project is create, using biomimicry, an air cleaning and CO² catcher integrated urban device. Looking at nature we can learn from one of the most unique trees in the world, the Dragon Blood Tree (Dracaena cinnabari). 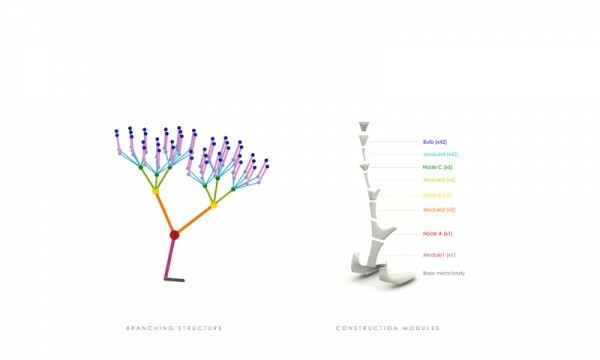 Its branches at maturity produce an umbrella shaped crown optimizing its form to create a canopy that provides a maximum of shading surface. 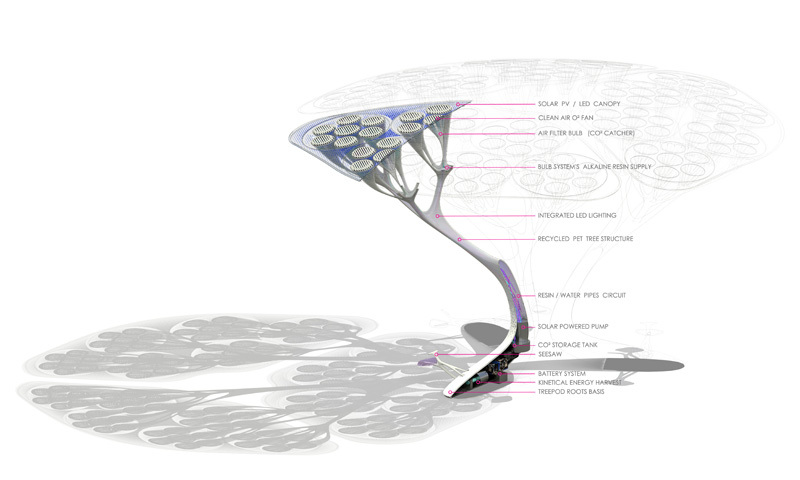 The way that its canopy allows the wind flow is showing us an intelligent form like design. 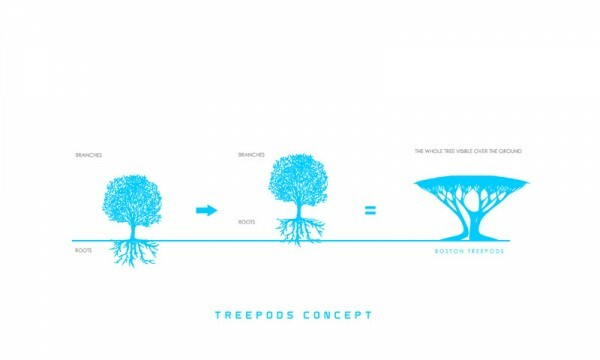 The TREEPOD will ne inspired by that, as well as by its branching structure in terms of storage and distribution of resources from ground to the canopy. The TREEPOD takes the Dragon tree like form to create an important canopy surface that will provide shadow, and that will host a solar pv (sun tracker latest technology) to harvest the energy necessary to powered the air cleaning system and the urban lamp function. The canopy branching structure ends with a myriad of bulbs. They multiplies the contact points between air and the CO², serving as a filter. Working like as alveoli in a human lung, here is where the cleaning gaseous exchange takes place: an alkaline and environmentally friendly resin that reacts with air holding CO². When the CO² saturated resin reacts with water it release CO² for storage, and then it could be used again in the same process. 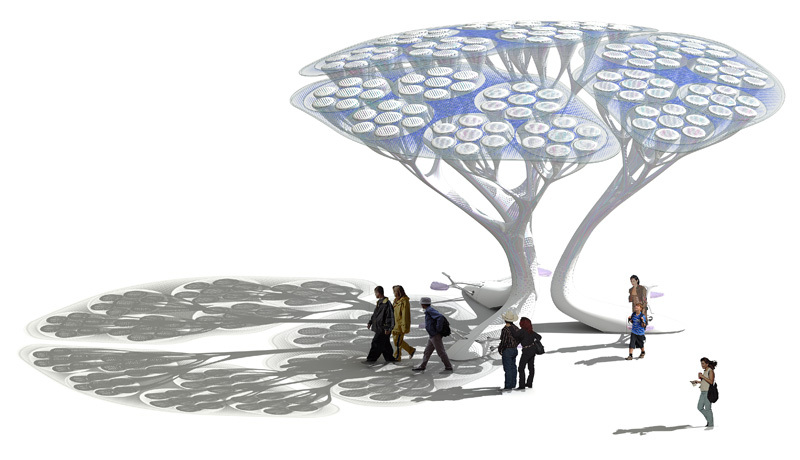 The tree will be made with a recycled and recyclable plastic. We propose to use the PET (Polyethylene terephthalate). It is the material commonly used for drink bottles. It presents several relevant advantages: it’s available in large quantities as recycled raw material, it can assume different colorations and degrees of transparency, it can be easily processed to obtain complex forms, it has good tensile resistance and mechanical properties. The entire TREEPOD structure is composed by modular elements, assembled as shown in the scheme. 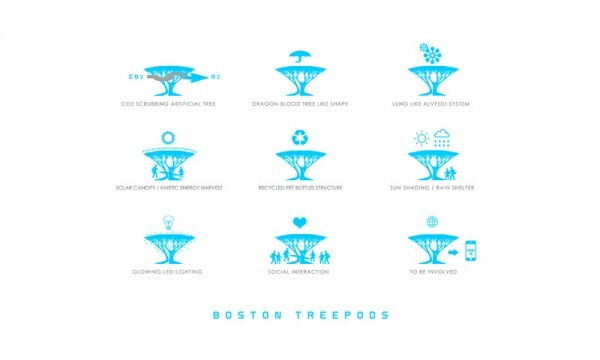 We suggest to create a network of TREEPODS system using this new technology, that will embraces the whole city of Boston. Based in its modular capacity, issued from a honeycomb hexagonal geometry, the prototype is able to reach tree different levels of assemblage and urban function: The basic isolated unit as urban furniture. 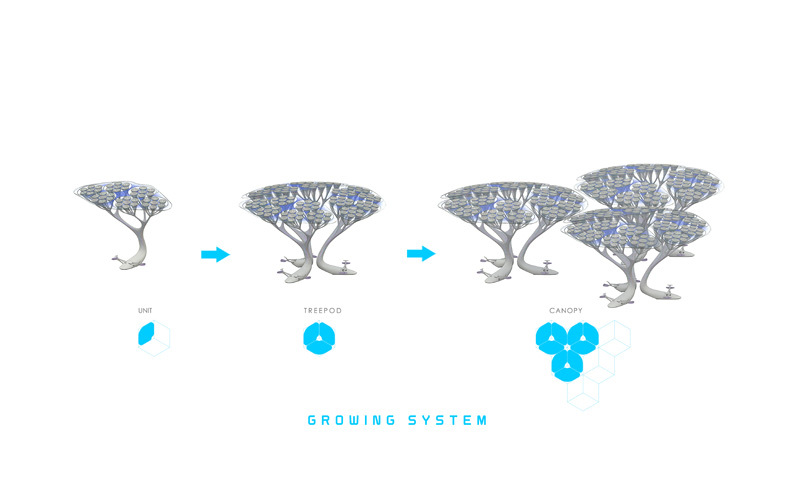 Three assembled units forming a hexagon define the TREEPOD, with social functions that a natural tree had. 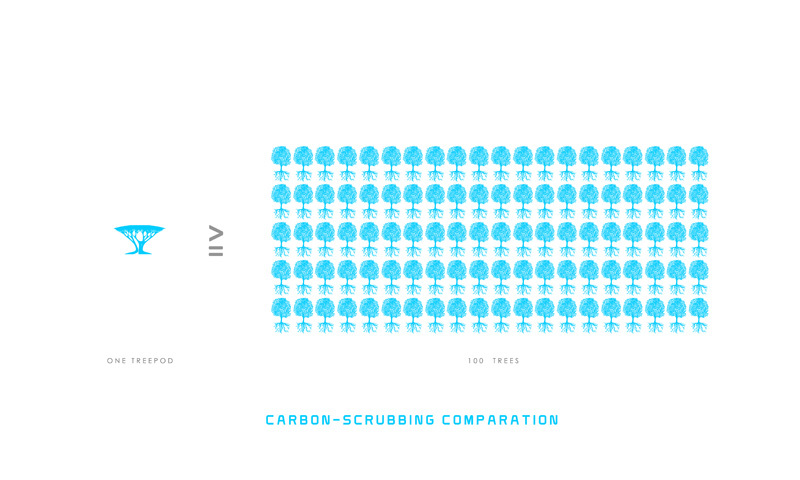 And finally, a group of trees, creating a great urban canopy, defining places to be. The TREEPOD will have a social role in the community. 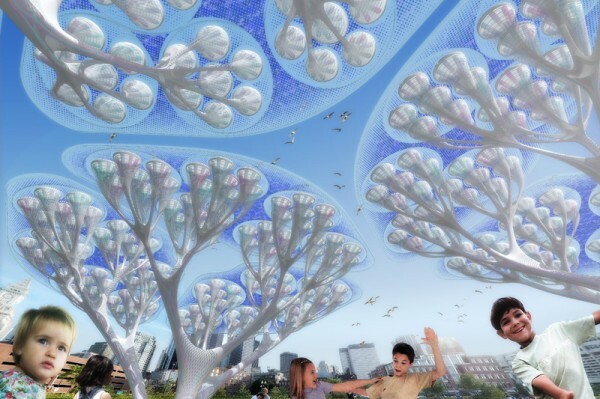 It could be an interactive interface, allowing people to interact with the tree and each other. People could play and learn about the ecological paradigm shift. At its basis the tree will host a playing device: a seesaw that harvests kinetic energy. It will allow people to be involved, displaying information in “augmented reality” about de-carbonization process, about sustainable behaviors etc, proposing depending the urban and social context, different ways to help people collaborate each other and to engage citizens in the green agenda.